Since it would be impossible to compress this to fit the advice box, I'll post it here. 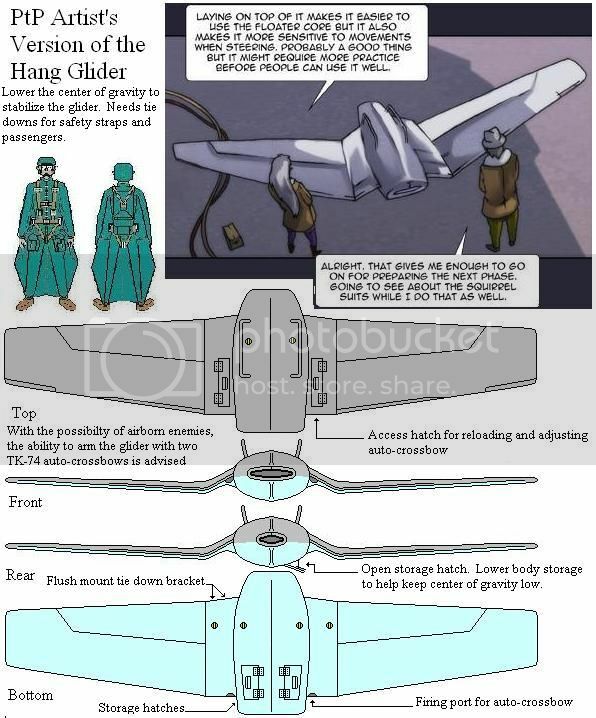 For the hang glider - Add cargo hatches to the lower body so storage and/or ballast can be added to further lower the gliders over all center of gravity below the wings. With the pilot above the wings the over all weight must be centered below the wings for flight stability. If the weight center is at or above the wings the glider will be unstable in flight and hard to control. So lowering the center of gravity should improve its flight characteristics. Next - Add secure mounting points on both the top and bottom surfaces to attach the safety harness of the pilot and any passengers to. Finally - While I won't demand or push it, I believe adding the access doors and mounts for later installing of auto-cross bows in the wings to be a good idea. 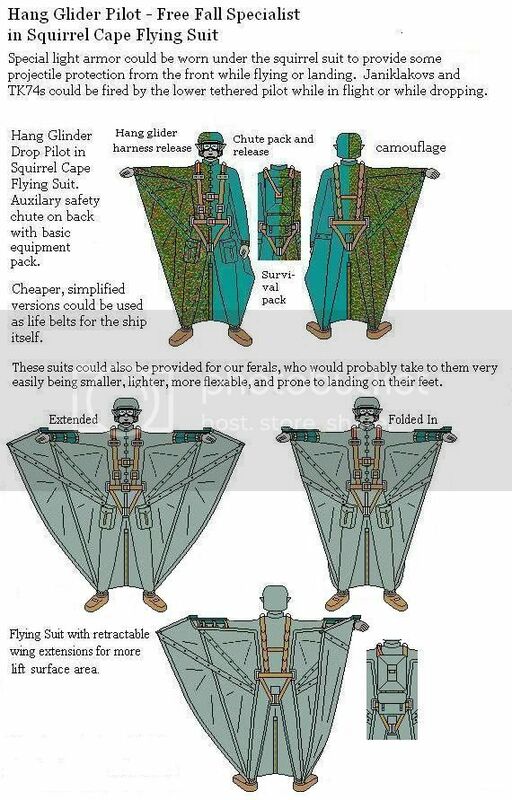 For Squirrel Suits - There was a provision made in the original design for swing arm extensions beyond the hands to add over a foot more wing spread to each side. These are attached to arm braces that also act as joint strengtheners and arm guards in combat. When folded back the arms are secured to the arm braces and the excess wing material tied back to the other wing surface. This extra wing surface would increase the effective lift area by 30%. The wing surfaces are meant to end about a hand span or so above the bottom of the boots for ease of walking. The wing cloth between the legs is divided into two halves down the middle and laced together to make a single surface. Once on the ground, the lacing is pulled out and used to tie the two rolled up flaps to the legs in order to make walking or running easier. What we're after is controlled descent with hover possibilities. 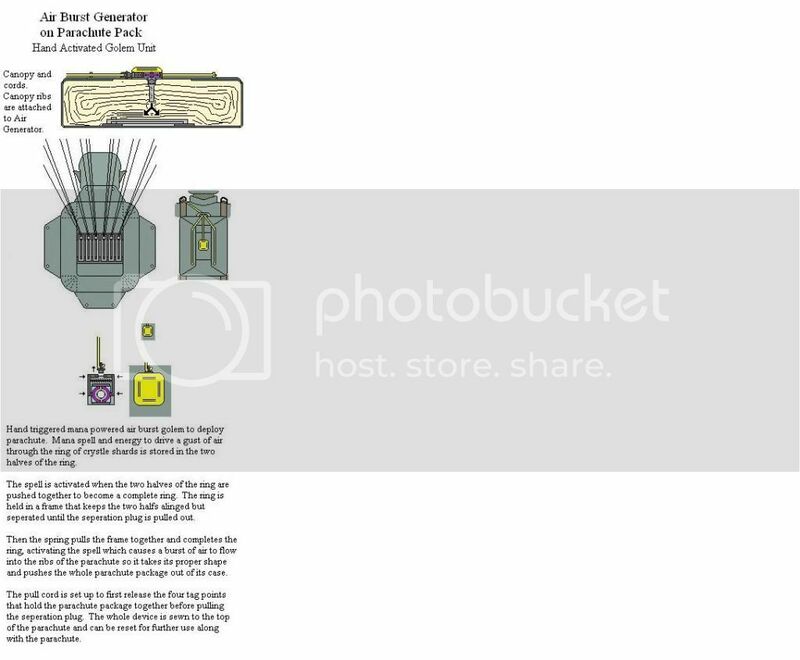 For Parachutes - If possible, work on deployment system.